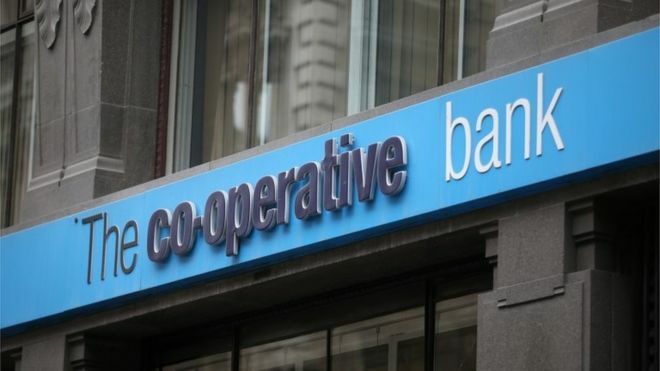 The Co-op Bank says it is putting itself up for sale and is inviting offers to buy all of its shares. The bank, 20% owned by the Co-operative Group, almost collapsed in 2013, and was bailed out by US hedge funds. The bank has four million customers and is well known for its ethical standpoint, which it says makes it “a strong franchise with significant potential” when it comes to a sale. It has not been able to strengthen its finances because of low interest rates. A spokesman for the Bank of England’s Prudential Regulation Authority said it welcomed the action announced today by the Co-operative Bank. “We will continue to assess the bank’s progress in building greater financial resilience over the coming months,” it added. From among potential buyers, the TSB has told the BBC that although it is focused on completing the separation of their IT systems from Lloyds, it would be interested if the price was right. The Co-operative Bank merged with the Britannia building society in 2009. The deal was later held responsible for the near collapse of the bank. In 2013, the bank revealed a £1.5bn black hole in its accounts, which led to its rescue. Bank chairman Paul Flowers also stepped down over concerns about expenses in 2013, before pleading guilty to drug possession the following year. And in January 2016 the Bank of England banned two former Co-operative Bank executives – former chief executive Barry Tootell and former managing director Keith Alderson – from holding senior banking positions. In the autumn of 2015 the Co-op Bank said it would remain loss-making until the end of 2017. Dennis Holt, bank chairman, said: “Customers value the Co-operative Bank and our ethical brand is a point of difference that sets us apart in the market. The bank also said it had made considerable progress in delivering its continuing turnaround plan. And it says it is considering ways to raise funds from existing and new providers. Separately, it says it has resolved a key contractual differences with Capita. Western Mortgage Services, part of Capita, will continue to provide mortgage administration services and new mortgage application processing for the bank and its clients. One [buyer] suggests itself: TSB, which was carved out of Lloyds to satisfy competition concerns over the scale of the Lloyds/HBOS merger. With 600 branches, it lacks the scale to compete against the Big Five and it has a very strong capital position with no legacy issues. Whether the bank would want to take on the problems of Co-op is questionable but it terms of brand (both have a local and ethical flavour to them) it might work. Determining the right price will be hard as the amount of capital any buyer needs to sink into the Co-op is very far from clear.